Here Comes The Sun and Heat! Is it summer already? ...the temps have been very high here the last couple of days...not complaining after all the rain and cold. I am glad the sun is here which brings me to the theme of this card: Here comes the sun! which is the challenge at The Pixie Cottage this week. I used "Hannah in the Garden" stamp and colored her using Copics, pencils and markers. I used their sketch challenge as well. The Pixie Cottage: Use sketch #71 and/or theme. 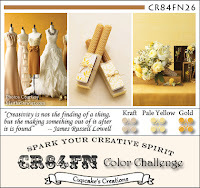 Cupcake Craft Challenge: Zesty Colors of Orange, yellow, green, and white. Phindy's Place Challenge: Summer Living. Love to spend time in the garden in the summer. Crazy 4 Challenges: Show a favorite vacation spot or activity. I love to spend time in the sun and gardening. 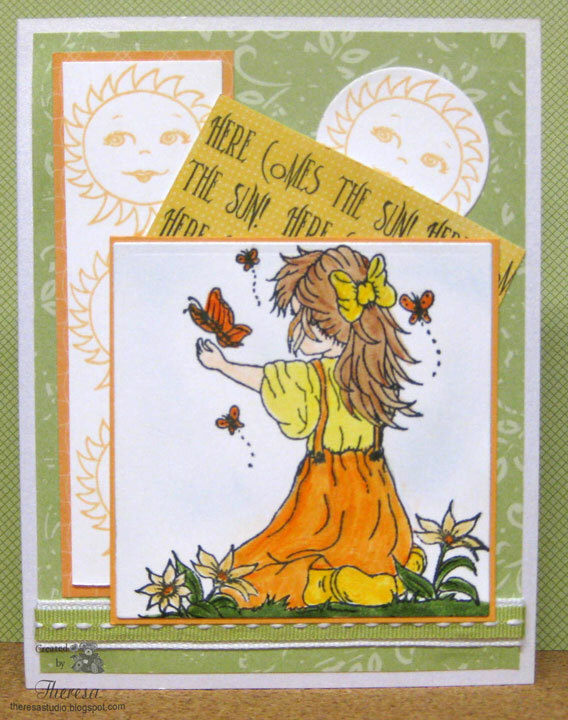 Stamps: The Pixie Cottage: "Hannah in the Garden"
Mark's Finest Papers "Hello Sunshine"
It is forecast to be in the 90's today. Black and white cards can be interesting to make. I used a digital paper as my background that I had downloaded from Jak Heath Designs from a special fund raiser. More of her lovely papers are here. 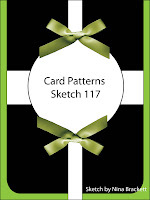 I used a sketch from Card Positioning Systems which happens to be sponsored by Gina K Designs this week. I stamped the image from GKD "Buds & Vases" by Melanie on GKD White CS with Memento Tuxedo Black and added some shading with Copics C1 and C3. Cut this with Nesties Rectangle die and placed on GKD Black CS cut with large label die. 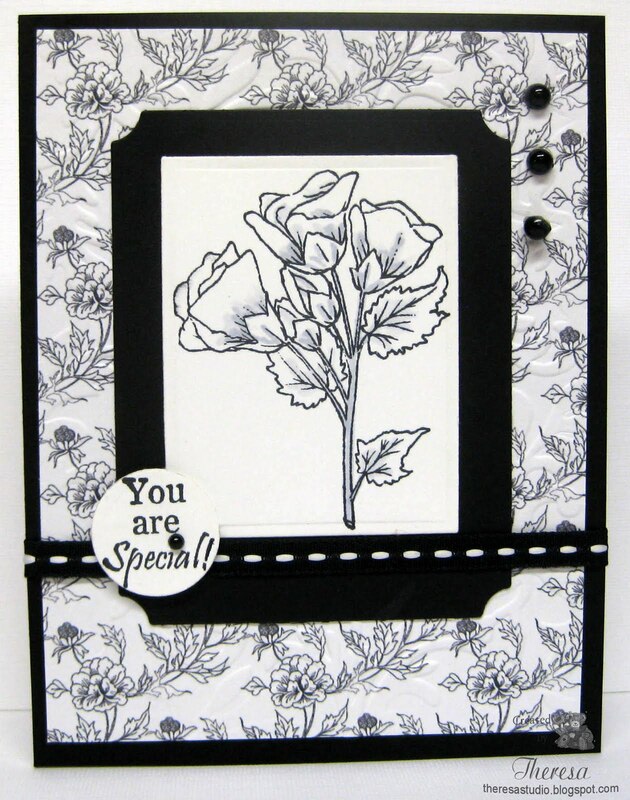 Love how the image looks on the floral paper with a black card base. Embossed the mat with CB EF Victoria but hard to see in photo. Finished with a sentiment on circle, ribbon, and Hero Arts black pearls. STV: GKDMAY11GS challenge to use black and white. ﻿ Thanks for dropping by. At There's Magic in the Air, Sheng brings us our challenge for us to make our own flowers and then use them on our card/project. I used The Rose Teapot image from Paper Cupcakes. I took off the lid and filled the pot with handmade flowers. I colored the pot with Copics RV21 and 23 and Memento Bamboo Leaves Marker. I cut out the pot and placed on a circle cut with Nesties circle die and matted on a pink scallop circle cut with nesties die. Added my flowers and leaves into the pot. I arranged all following a sketch from Card Patterns. Added ribbons and a mat of Basic Grey Olivia. Finished by adding the lid to the side with pop ups. Planned to add Glossy Accents to pot and lid but ran out of time. Will do later. There's Magic in the Air: Use own flowers on a card. 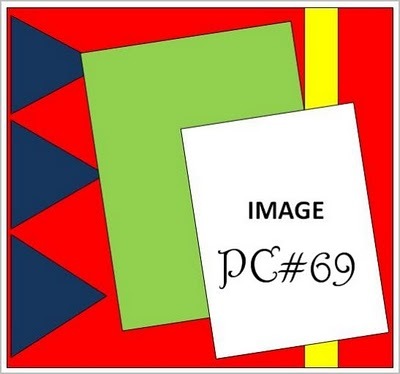 Card Patterns: Sketch 117 shown on lower left. 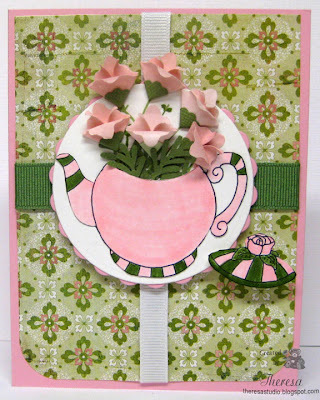 Crafty Caz Weekly: Use pink and green. I like to use a teapot to arrange flowers. 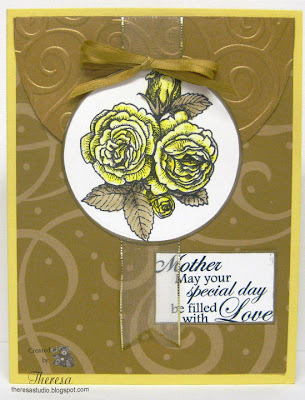 I think I am liking this stamping directly on kraft CS, at least I am trying it again. Did this beachy theme CAS card using shell border stamped in brown ink and colored with pencils. 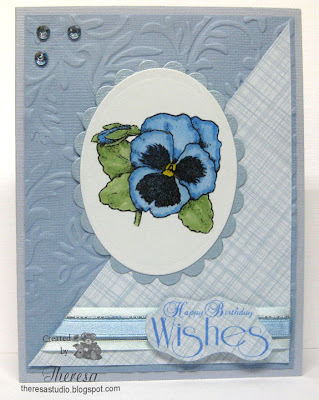 Embossed center with die for the sentiment and sponged on some blue to highlight the words and to make edge at bottom. Cute Card Thursday: Let's get krafty. Stamp Something: Create something with beachy colors. 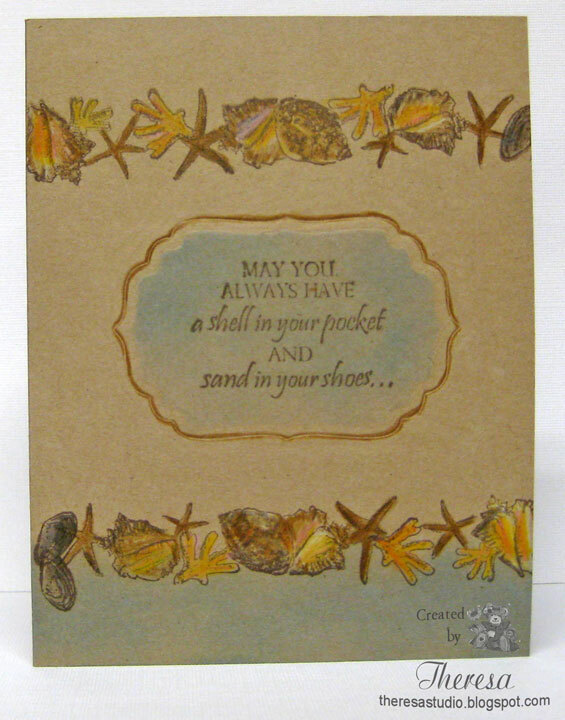 Used the colors of the beach in the shells, blue sponging, and what is more beachy than the kraft for the color of sand? Alphabet Challenge: C is for CAS-clean and simple. This is as CAS as it gets---a one layer card with lot of blank space...very simple. Stamp TV: Free for all Friday Challenge is "Let's get krafty." I have been having trouble with leaving comments on my friends' blogs and for blog hops the last couple days. I do not know if it is a Google or Blogger problems. I do hope it clears up soon. I am not ignoring everyone's great posts...thought I'd let you know that I have been dropping by. For Fun Challenges: Get Well card. Cooking it Up With Katie: Start with a sketch, make it for a Child and finish with some buttons. Used sketch shown lower left, Card is for a little girl, and used butterfly buttons. 2 embellishments, and 1 ribbon. Used 3 pattern papers- stripes, floral, and pattern for paper piecing the dress. 2 buttons for embellishments and a bow from ribbon. The Paper Players: Sketch challenge shown on lower left. 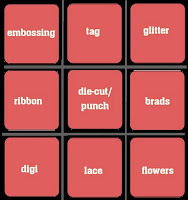 PaperPlay Challenges: Use sparkle galore. Lot of Sparkle on stripes and floral glitter papers. 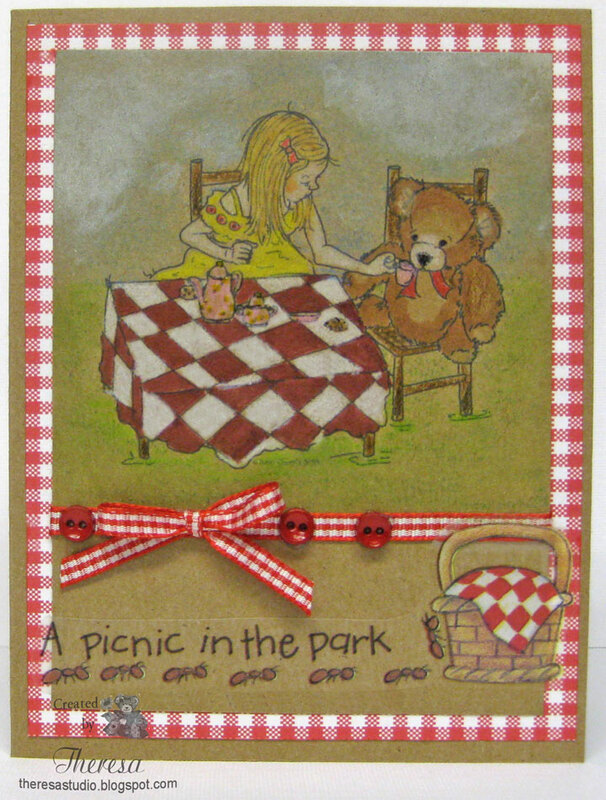 Stamptacular Sunday: Bear Necessities-Use at least one bear on project. Stamps: My Favorite Things - Pure Innocence "Better Get Better"
I made this card following the sketch from The Pixie Cottage challenge shown lower left and used their challenge theme of Pink Girlie. Also added some sparkle with Sakura pen to the scarf, pearls, edges of dress, shoes and raised embossing. Finished with a handmade flower of crepe paper. 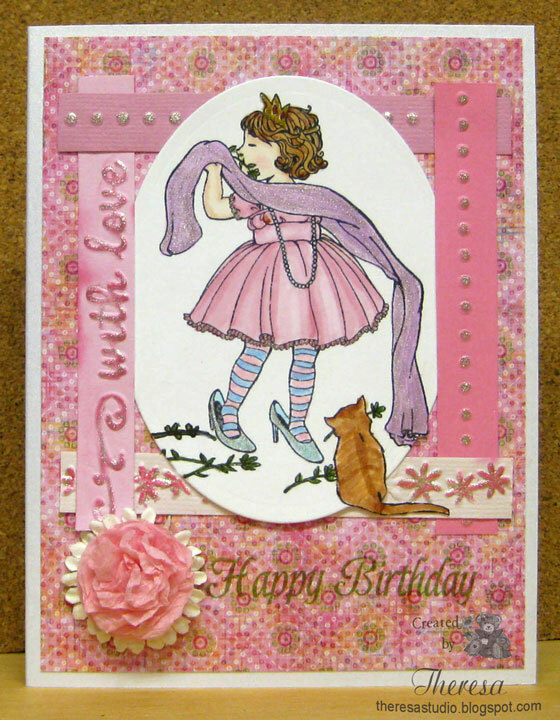 The Pixie Cottage: Use sketch and/or theme of Pink and Girlie. Crafts and Me Challenge: Anything Goes. Paper Pretties: Use Flowers on your card. In Pattern Paper and handmade a flower. Simon Says: Sparkle and shine. May have to enlarge card to see all the shine better. Charisma Cardz Challenges: Birthdays in Pink. Craty Catz Weekly Challenge: Anything Goes. Stamps: Crafts and Me "Romeo, Oh Romeo"
Nina at There's Magic in The Air had a beautiful image that was free this week. Hope you had a chance to get the "Lovely Peony in a Vase". Printed the image and colored with copics. Then added some embossing for Molly's challenge at TMITA. Digi Doodles Shop's Best: Challenge is embossing. 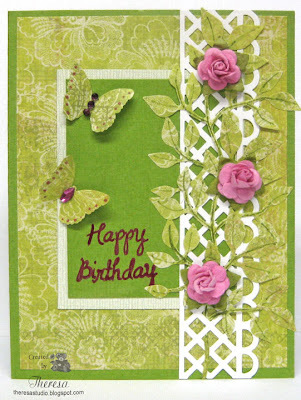 Creatilicious Challenge: Create something with Flourishes - it can be a diecut, stamp or even pattern paper. I have flourishes in my Embossing on a mat, in my DP, and on the sentiment. 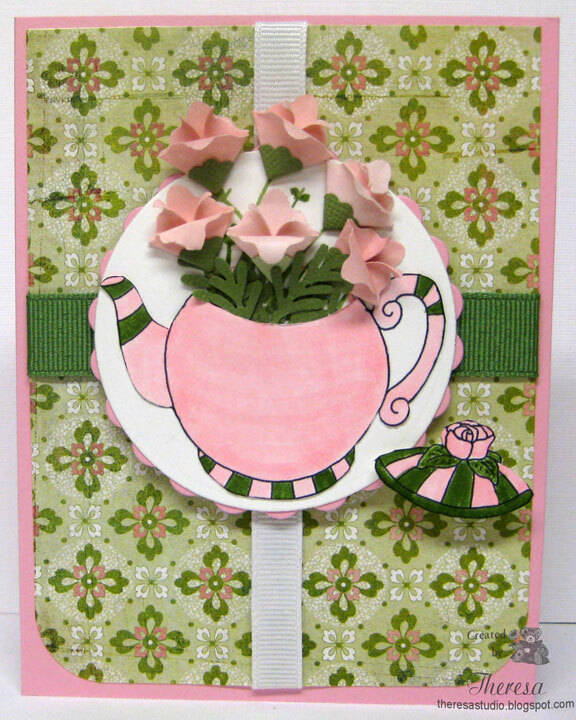 Paper Cupcakes Image "Peony in a Vase"
Cuttlebug EF Floral Fantasy, With Love Borders(On sentiment, Strip on ribbon, and Edge of base card. This card was made with the sentiment as the focus and with handmade flowers. Love this DP as the background. Used a sentiment from Raindrop Echo Designs and Designer Paper from Basic Grey Sweet Threads. Oyster Pearl is the base card and Pink CS from scraps. 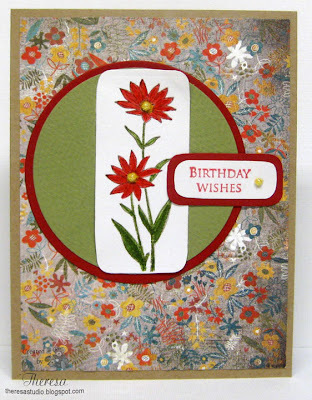 Made flowers with Spellbinder Daisy Patch dies and Basic Grey brads. 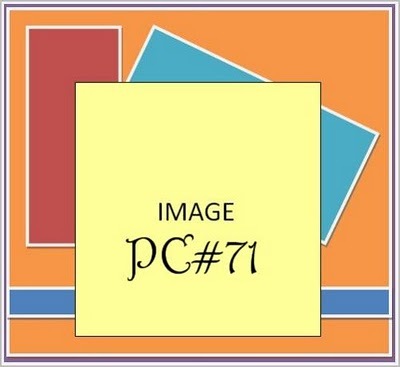 Used Spellbinders Label 4. Distress Inks used are Wild Honey and Tea Dye. Did some highlights with Sakura Clear Star Pen. Sentimental Sundays: Use handmade flowers and a sentiment. Cupcake Craft Challenge: Theme is "In the garden". 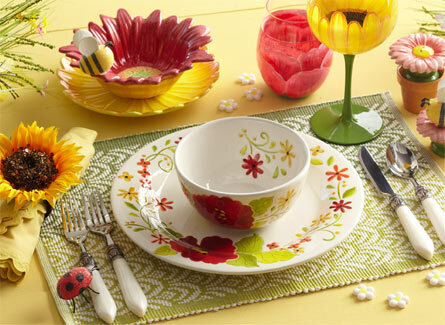 Fab 'n Funky: Make your blooms. I made this card using a sketch from Sweet Sunday shown on lower right. Have to hurry to post since it is close to entry time cut off. 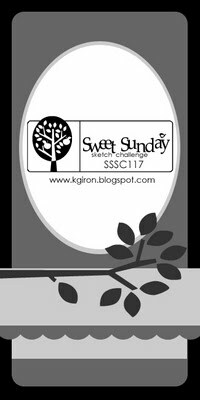 Sweet Sunday Challenge: Made card sized 3.25" X 6.5 " with sketch. The Ribbon Girl: Color Challenge Use Pinks and Lilacs. Cuttlebug: EF Border "With Love"
Beautiful weather here today. Spent the day planting and working outside. Now it is time to post a card. Made this with a stamp set from Paper Pretties that I won.....thinking of grilling fun to come. Used Sketch from Sweet Stop but challenge closed. CE84N28: Color challenge to use red, yellow and neutral. 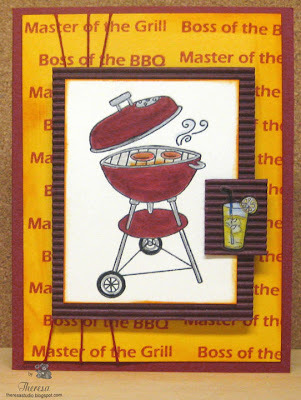 Cards for Men: Card for a someone special ... this is for my DH who loves to grill. 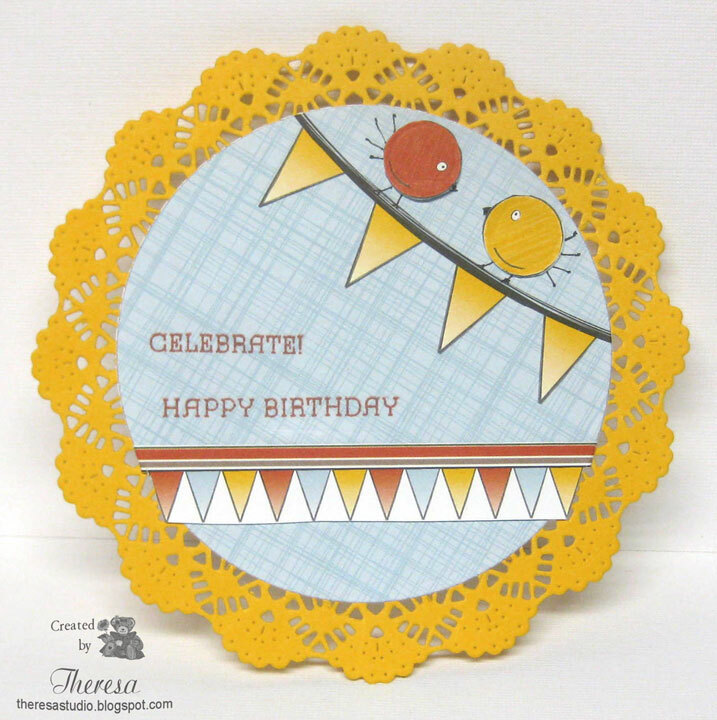 Crafty Caz Challenge: Anything goes. 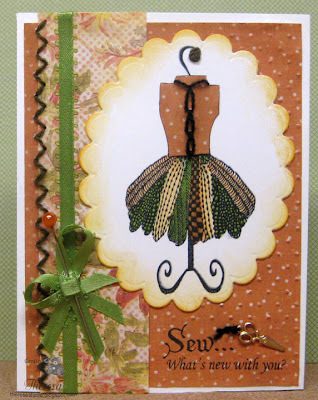 This was a very easy card to make because I used the fun paper from a pack by Nikki Sivils that I came across in my stash... must have been part of a blog candy. 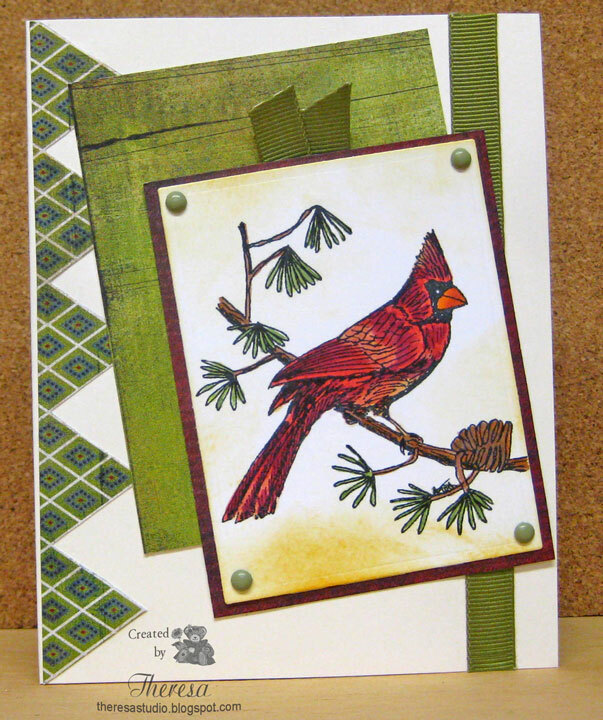 I was working on another card and looking for the right paper, but when I saw this sheet with the pennants, I immediately thought of this week's Sketch 115 from Card Patterns. I started with a yellow doily cut with a Cheery Lynn die. Cut the circle from the pattern paper with the pennants and then added a strip of pennants cut from another sheet in the paper pack. 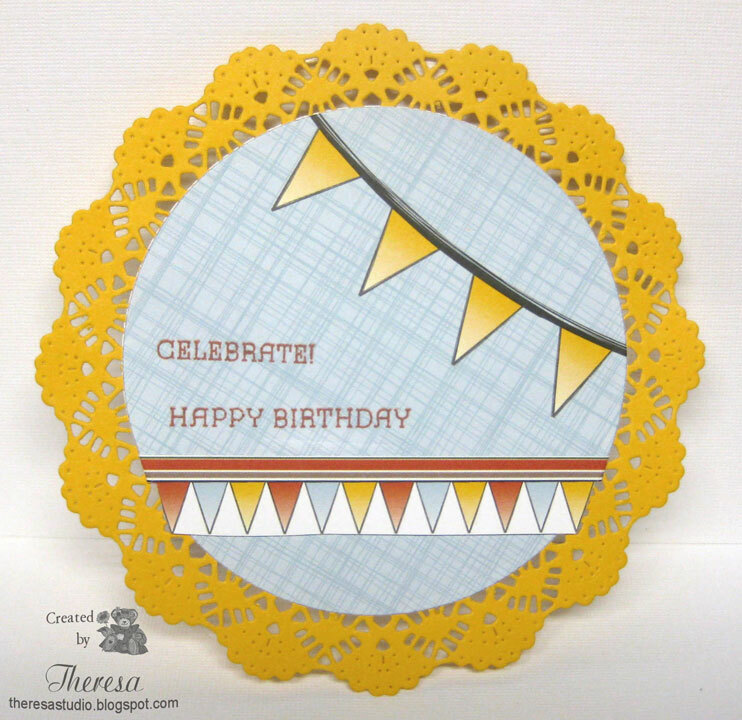 Stamped the sentiments from Flourishes "Birthday Pennants" set in Memento Potter's Clay. After I took photos, I decided to cut out some birds ( from the same paper pack) and added to the rope. Finished the back of card with two circles of white CS atttached at the top edge to create the inside of the card. Showing above: the original card and to the right : With the birds. The hardest part of this card was removing the "chads" from the punched die. The paper pack by Nikki Sivils is "My Friend Birdie". Used GKD Yellow CS. No coloring, embossing, and not much stamping to make this cute card. 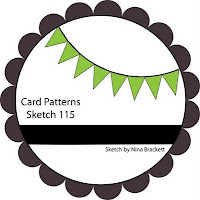 And what a fun sketch from Card Patterns. Challenge here. C.R.A.F.T. Challenge : Make a simple birthday project. They are celebrating their 2nd Blogaversary. 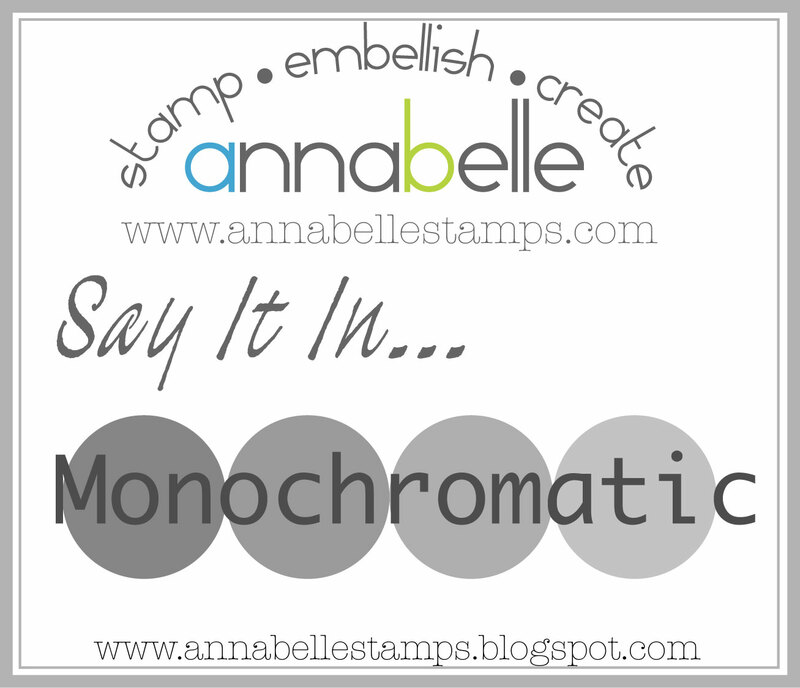 There have been several monochromatic challenges this week and I chose to do this card for the ones at Speedy the Cat and Annabelles as well as some other challenges. Speedy the Cat's Friends Challenge: The challenge is from Joanne who challenges us to use monochromatic blues. 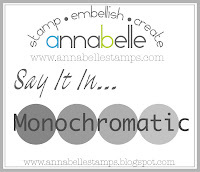 Annabelle Stamps Challenge: Say it in monochromatic. Added some bling for good measure. 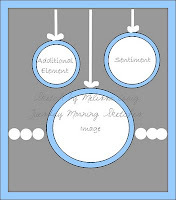 Shelly's Images: Bling it up a little or a lot. 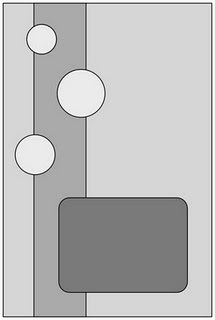 Fussy and Fancy: Use sketch shown lower left. Rotated the sketch for my design. This is a great sketch...had done an earlier entry but was messed up in the Blogger mix up. 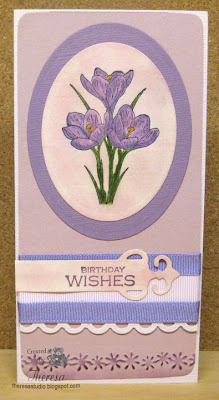 Really Reasonable Ribbon: Anything Goes...used 2 ribbons layered on card. There's Magic in the Air: Molly would like to see us use some kind of embossing on our cards/projects this week. I did embossing with Victoria EF. 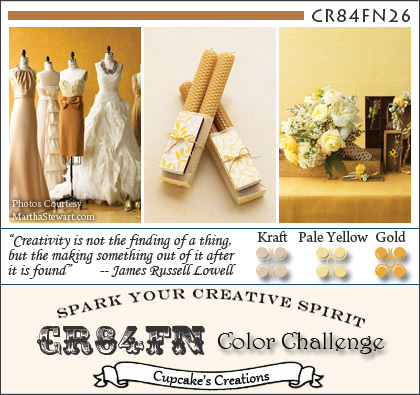 I usually do this challenge with a Paper Cupcakes Image but mixing it up this week. I still plan to do another entry with their freebie digi image this week. Check it out...great image with peonies. 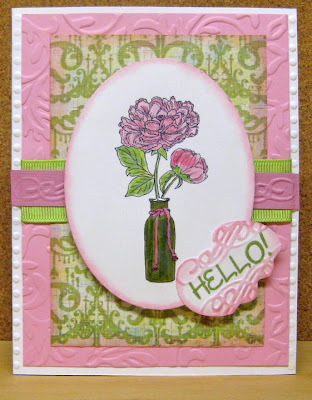 Stamp TV: Mix it up Monday challenge-focus on flowers. Truly Scrumptious: Anything goes! Too easy to pass up. It has been too long since I did a challenge for Lili of the Valley, so I made this card to enter into their Ribbons and Bows Challenge. Lili of the Valley: Use ribbons and bows.....added ribbon to the bouquet bow and in the scalloped edge and above that edge. Double bow under the flower. 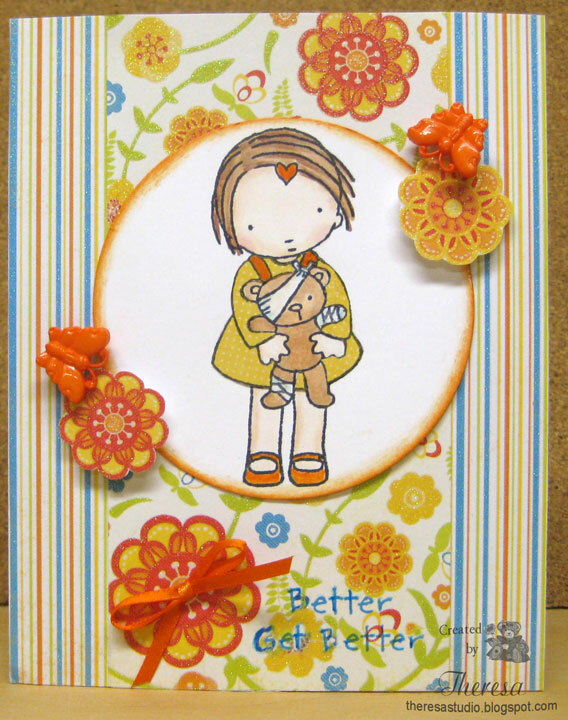 Cute Card Thursday: Use distressing. Distressed with ink on the scalloped circle, edge of mat and on the lace. Delightful Challenge: Use flowers on your project. 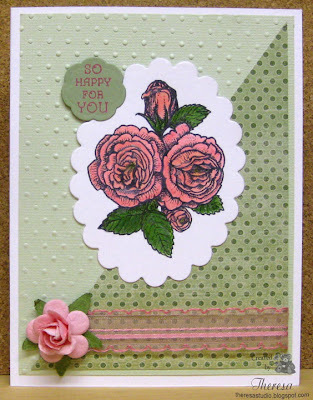 Flowers stamped in the image, in the DP, and added paper rose. 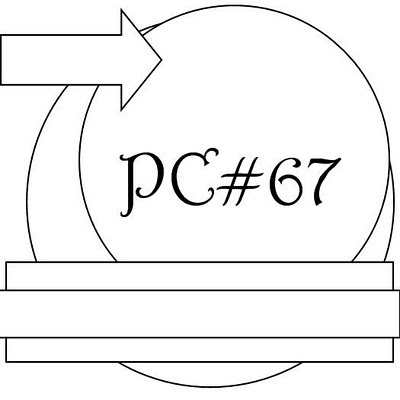 Wag 'n Whskers: Use circles. 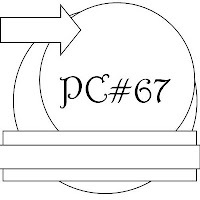 Circles in the DP and used circle die. Stamptacular Sunday: This week's challenge is “PINK-a-Licious!” Used pink in flowers, ribbons, lace, and papers. Hope the bit of green in DP and leaves does not disqualify the card. Papertake Weekly: Bloom and grow. Lot of flowers blooming on my card. Really Reasonable Ribbon: Challenge is Anything Goes. Used both ribbon and lace. Stamp: LOTV "Bear with Bouquet"
This is my second post today as I am trying to catch up on challenges. I have never printed images on kraft paper and colored them. The challenge at Sassy Cheryl is asking us to do that and that is what I did. I am not sure that I care for this as it is hard to get the coloring right. I used a combo of Copics, pencils and makers and did some sponging too. Sassy Cheryl's Challenge: Get Krafty! 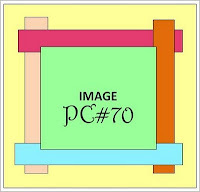 That means color up the image that you printed on Kraft paper. My verdict whether I like this as I said is still pending. 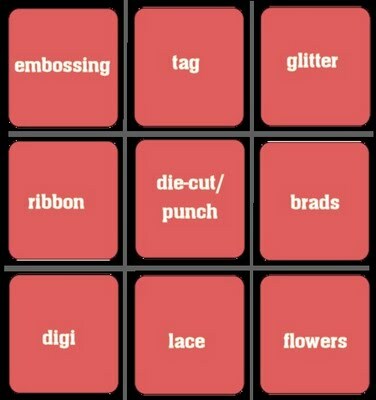 Fab 'n Funky: Use buttons and bows. 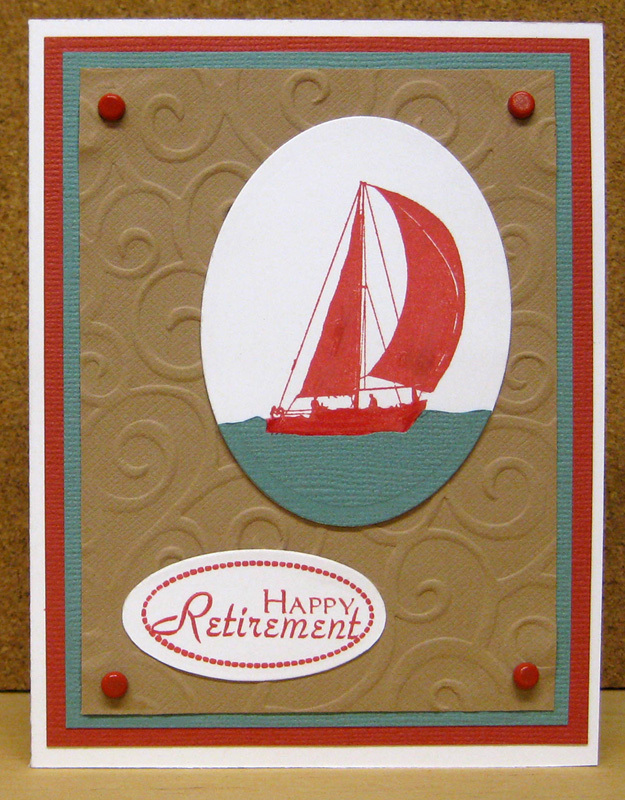 I thought the gingham bow and red buttons were the perfect finish to this card. 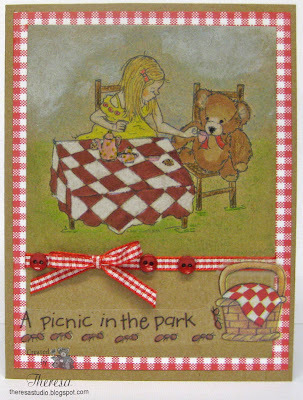 Allsorts Challenge: Theme is Teddy Bears Picnic. What better image for this theme? Wee Memories: "Get Sticky!" ... use stickers, rub-ons,etc. I had the perfect sticker for this card in some old scrapbook supplies. Digi Image: Sassy Cheryl's "Teddy Bear at a Party"
Colored with Copics, Pencils, Markers, Ink pads, etc. Rub-ons from "Me & My Big Ideas"
Do you like the effect of printing and coloring on Kraft Paper? I have been trying to get back in the groove of card making, posting, blogging and commenting since Blogger interrupted my routine last week. Have had a hard time finding my mojo and have not been doing much commenting to my friends. I hope to get back to visiting everyone soon. Pixie Cottage: Challenge is the sketch below right and/or theme of "Tag You're It!" I combined both in the card. The ABC Challenge: U is for underneath. 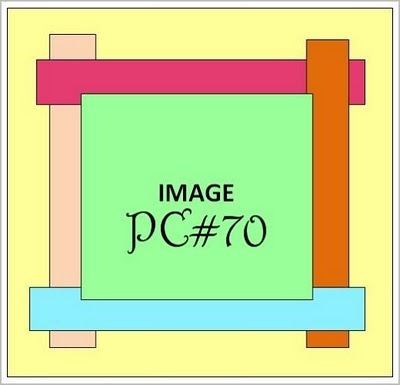 I placed my tag underneath the image. DYSU Challenge: Add a Tag! Tag is shown below. Basic Grey Challenge: Use a mix of your BasicGrey crafty goodies. I used 3 Basic Grey papers from Jovial and Oliver and added Basic Grey Brads. The Beary Sweet Challenge: Challenge is Nature. 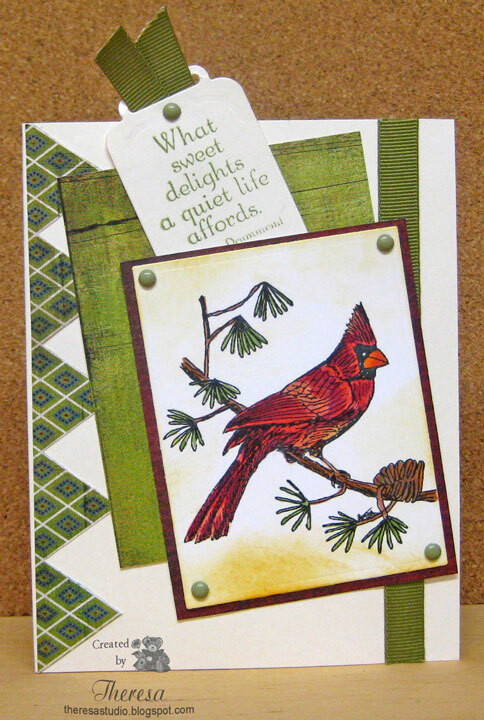 Love to be out in nature and watch the birds, so I used this cardinal on my nature card. Stamp Something: Challenge is Anything Goes for their third year Celebration. Happy Birthday to Stamp Something!! Kaboodle Doodle: Challenge this week is a game of TicTacToe -using the board shown below. I chose the middle row and used ribbon, die-cut, and brads. Stamp: Pixie Cottage "Cardinal by Artish", Flourishes Sentiment "Lenten Rose"
This post should make up for some of my lost time doing challenges. This is a card that blogger lost in all the mayhem last week. Found for the sketch challenge below. I rotated the sketch for my card. Fussy and Fancy: Used sketch. Stamp: Flourishes rose from "Year in Flowers" and sentiment from "Birthday Pennants"
Raining here today, so I am playing inside today. 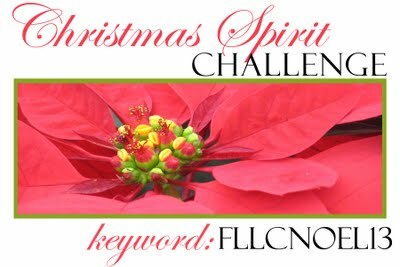 I am not really ready to make Christmas cards but thought I'd play in Flourishes' Christmas Spirit Challenge again as well as Christmas Cards All Year Round as they have a great sketch this month. The Flourishes challenge is to use a Poinsettia Flower on your creation and use Flourishes stamps. This is then linked to their SCS thread. 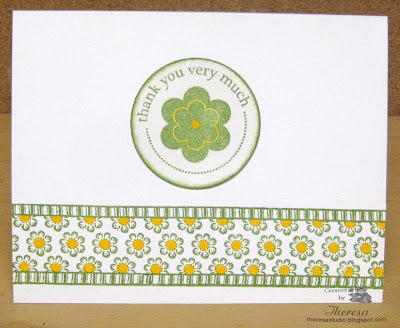 I used Flourishes stamps from "Poinsettia and Boxwood" set. I stamped the poinsettia in Memento Tuxedo Black and colored with Memento Marker Rhubarb Stalk. Also stamped some bows and sentiment with Rhubarb Stalk and cut out with circle and blossom dies. 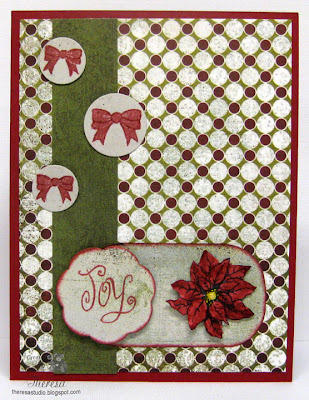 I used Red CS as my base and matted with Basic Grey Figgy Pudding papers. 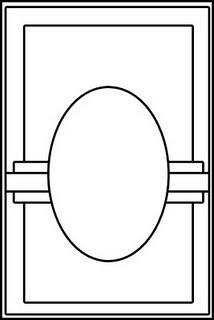 Arranged all the elements using the sketch shown below. Hello everyone. I have been busy outside doing yard work and cleaning the garden beds the last few days and have not spent much time blogging and card making. We finally got some sunshine and warmer temperatures so I am taking advantage of the weather. After the winter we had, it is a much welcomed relief to be outside. Also doing some house maintenance and preparing to have the house painted soon. 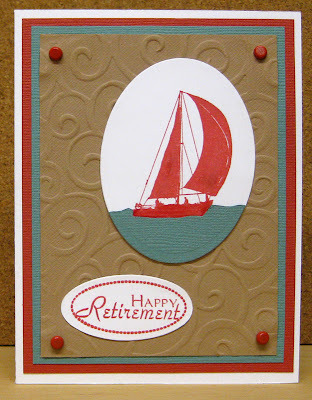 That's what you do when retireed....thought this card was appropriate for today since I made it as a Retirement Card. I am posting this one that I made sometime ago but never posted. I found some challenges that it fits so thought this would be a good time to show. I did paper piecing for the sea and used several layers of mats. Fairly simple card. City Crafters: Theme is by the sea. 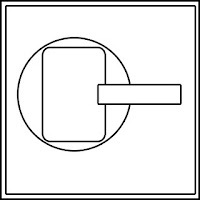 Papertake Weekly: Use punch or dies. Simon Says: Use paper piecing. 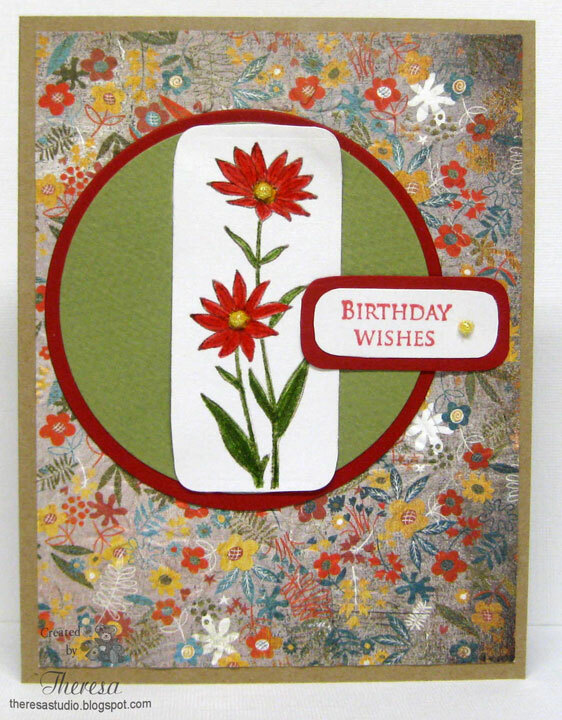 This is a one layer card using a circle or multiple circles on a card that I made for the Round and Round Challenge at Simplicity. Sorry the photo distorted the shape of the card making it look crooked.Guess I should have reshot but just not time enough. 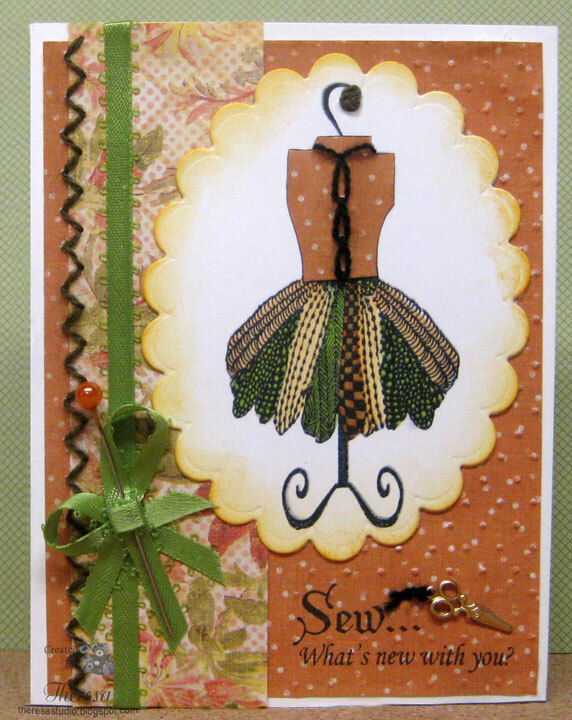 Also entering Creative Vision Saturday Challenge - Make a CAS Thank You Card. 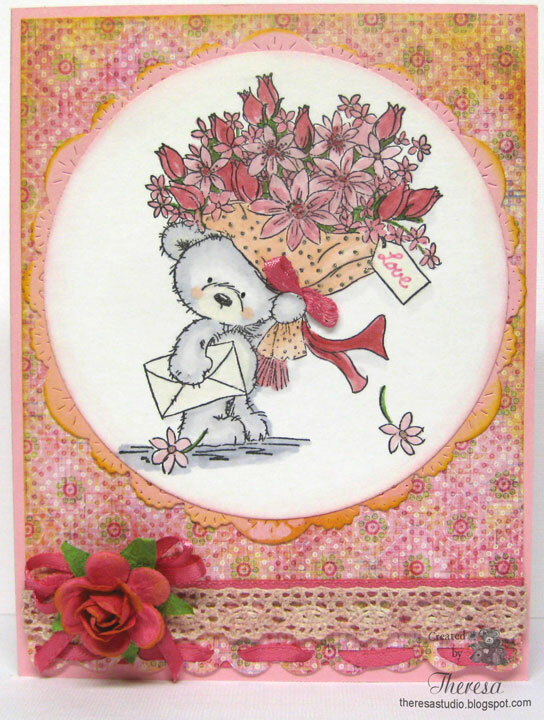 This is a quick post for the challenges at Card Patterns, CR84FN and Sentimental Sundays. 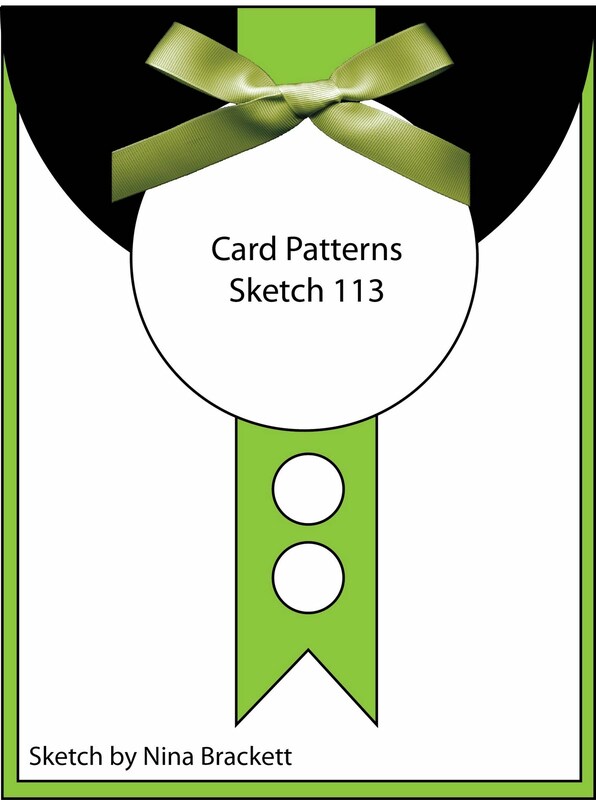 Card Patterns: Sketch 113 See below. Sentimental Sundays: For Mother's Day or For a Woman. Crafty Caz Weeekly Challenge: Use a quote or semtiment. 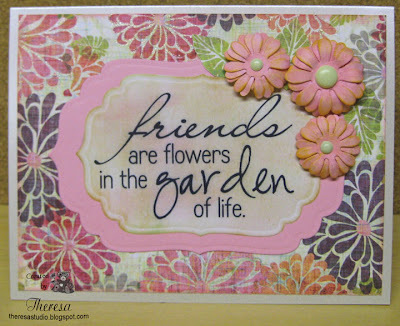 Stamp: Flourishes "Year in Flowers"
Stamp TV has started some new challenges. On Monday there will be a Mix It up challenge and this week it was an Inspiration one....to be inspired by the colorful photo shown below. I combined it with the Sketch challenge from Card Sketches at Card Positioning Systems using bright colored flowers for the floral background and for the image. 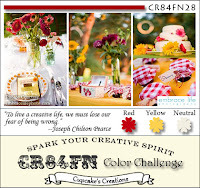 For Fun Challenges: Theme is all about Spring....Use lots of flowers. Oldie but Goodie: Say it with flowers. Stamp is one of my first GKD stamps...at lest 1 year old. 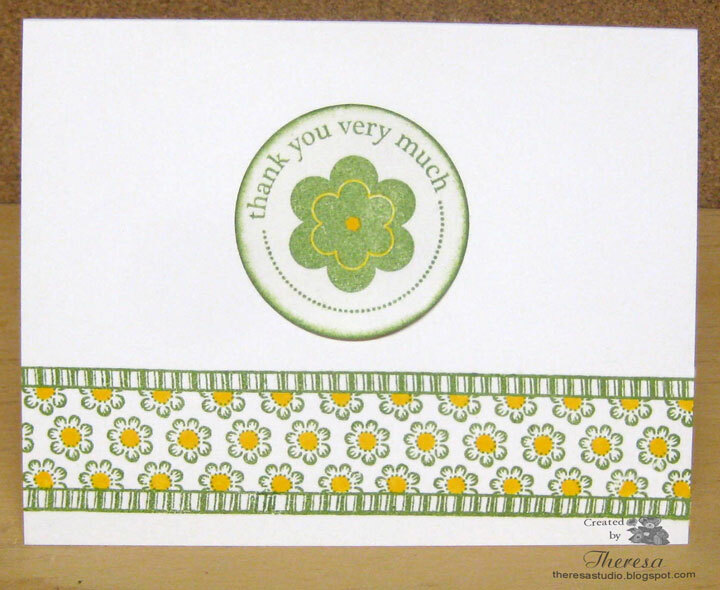 Stamps: GKD "Spring Florals" and "Elegant Flowers"
Thanks for dropping in, Theresa. I have this stamp set "Sew What" that I bought from Mark's Finest Papers but have never inked it up. Thought it was time to put it to use for Speedy the Cat's challenge from Vicki who asked us to use a hat pin on our card . And then there were some other challenges to use embroidery floss, stitching, and other elements that I tied in with the card. I stamped the dress form and colored the skirt with copics and paper pieced the bodice. Added some embroidery stitches (chain stitch and french knot) with the floss and also a zigzag row(used paper piercing. ) along the strip of PP. Finished with a ribbon and bow to showcase the hat pin and added scissors charm with a bit of floss. Used 2 more stamps to create the sentiment. Kind of a different card but was fun to assemble all the elements into one project. Speedy the Cat's Friends Challenge: Use a hat pin. By the way, Vicki stuck us with the bad news that she was leaving Speedy's Challenge. It has been fun having her there and I'll miss her at Speedy's. Our Creative Corner: Use embroidery floss. I had to dig out my box of embroidery supplies for this one. Been awhile since I did any embroidery. One Stop Craft Challenge: Theme is in stitches. Rather than use the sewing machine, I did my stitching by hand. Let's Ink It Up: Embellish it. Used ribbon, hat pin, and charm. 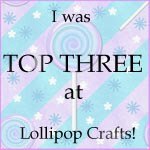 Lollipop Challenges: Recipe is 3 stamps, 2 Pattern Papers, and 1 embellishment. May have overdone the embellishments but it does not say only use 1 embellishment. Craft Your Passion: Anything Goes...that's easy enough. Simon Says: Use paper piecing or paper piercing. Use paper piecing on my bodice and also used paper piercing to make my zigzag line before stitching. Stamp and Create: Use a charm or crown. Used a scissors charm. Stamps: 3 from Mark's Finest Papers "Sew What" stamp set. I used to enjoy doing a lot of sewing...even made most of my clothing years ago. And also did a lot of needlework projects. Kind of miss doing that. I love this stamp of Hannah sitting in the spring flowers. I am using her on this card for the sketch challenge at The Pixie Cottage. She is colored with Copics and has glaze on her boots and butterflies. 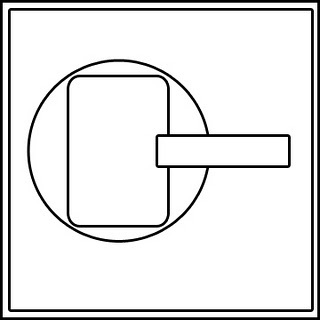 Image was cut with Nesties circle die as well as the mat of PP. Added the ribbons, sentiment, and butterfly charm to finish. The Pixie Cottage: I chose the sketch option to enter for their challenge. See lower left. Basic Grey: Theme is Be Charming...used butterfly charm and Hopscotch DP. 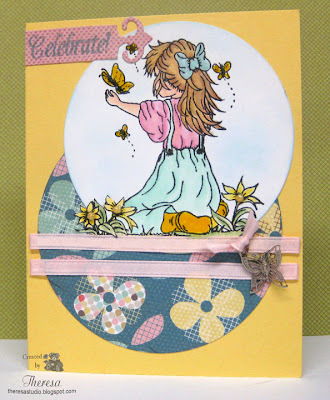 Charisma Cardz: April Showers/May flowers is the theme. Showing a May flower garden. Stamp Something: Something with wings is the theme. Stamped this image with Butterflies. Fussy and Fancy Friday: Theme is springtime. Prairie Fairy Friday: Theme is also April Showers/May Flowers. Wags 'n Whiskers : Use a punch or die. Circles dies used. Papertake Weekly Challenge: Anything Goes with option to use anything round. 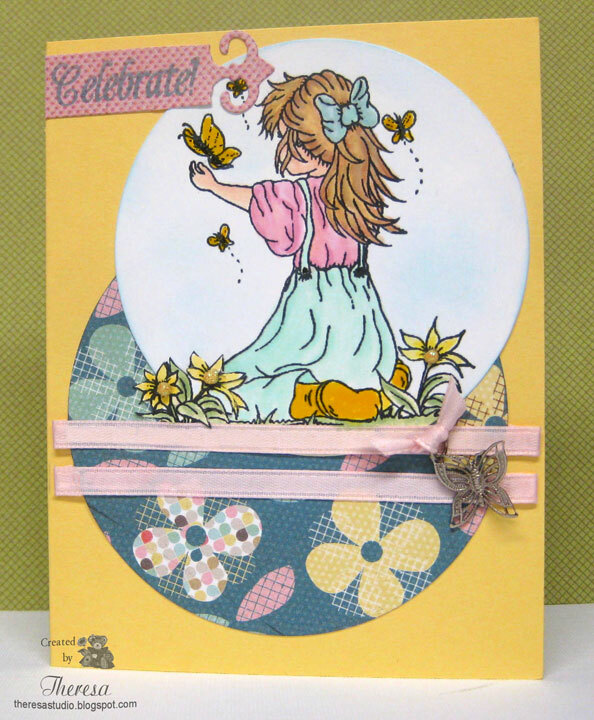 Stamp: The Pixie Cottage "Springtime Hannah with Butterflies", Paper Pretties Sentiment. Paper: GKD White and Yellow CS, Basic Grey Hopscotch Paperpad. It is still raining here. Hard to remember the last suuny day. I made this card for Joan's Garden Challenge #16 to use Colors Lime Green and Pink, lattice (either die cut or create with paper strips, leaves to create a vine on lattice and butterflies. I think my card covers all the elements requested. Stamp: Creative Vision "Make a Wish"
The King of the Jungle or Zoo, That Is! 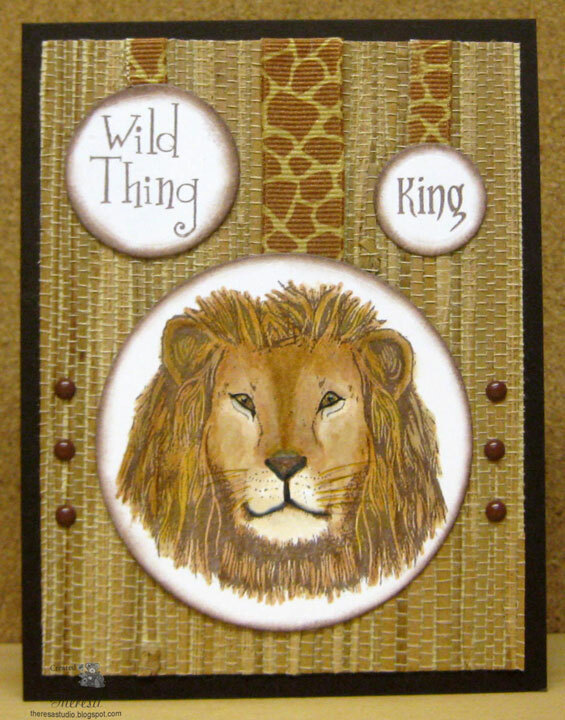 I love to play with Mark's Finest Papers stamp set that have the wild animals stamps and this week I found some challenges where I can use them. This is the first time that I used the lion and it was fun coloring him with Copics and then. pencils. I added some whiskers using Spica pens as well. Love the look on his face and I was pleased with my coloring. As a mat, I used some leftover grass cloth wallpaper ...not telling you how long I have kept this leftover wallpaper but it has been quite awhile. I used the sketch from Tuesday Morning sketches. Added some sentiments, brads, and ribbon to finish. Cards for Men: Use circles. Lion is good for a manly challenge. Tuesday Morning Sketches: Shown on lower left. Tuesday Throwdown: Add brads or eyelets to artwork. Brads are good for this king of the jungle. 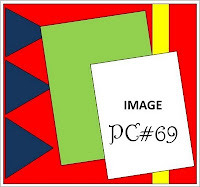 For Fun Challenges: The challenge this week is GREEN - not the color to be green. and recycle something. Recycled old wallpaper. Paperplay Challenge: Use an object not intended for crafting. Well that would be the wallpaper that I used. Alphabet Challenge: Z is for zoo animals. The lion is always a favorite on a zoo visit. Stamps: Mark's Finest Papers "Big Cats"